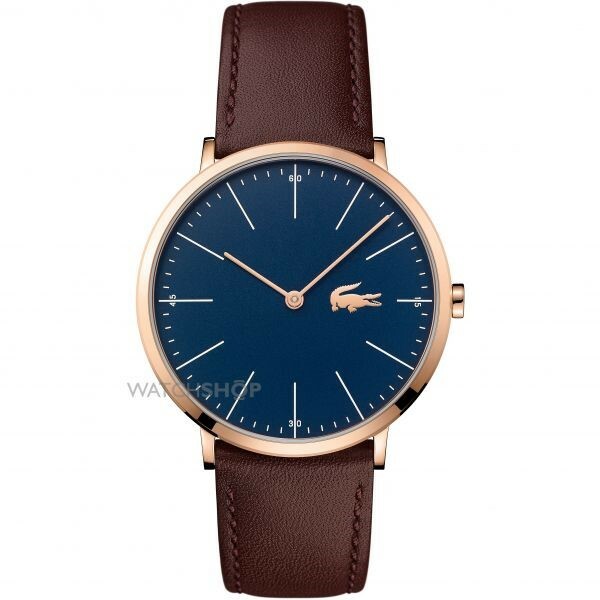 Simple lines, classic colours and that crocodile: Lacoste is instantly recognisable. For decades, Lacoste has been associated with tennis while doubling as a lifestyle brand, offering style both on and off the court. Whether you're practicing your backhand or revelling in the thrill of a match court-side, wearing a Lacoste watch (like the Montreal number above) often means you can bring flair to either outfit. We've picked a few standout pieces that showcase the very best of the brand. René Lacoste was born in Saint-Jean-de-Luz, France in 1904 and grew up to be a tennis champion. He ruled the courts in the 1920s, winning the French open, Wimbledon and the US open several times between 1924 and 1929. After being nicknamed 'the crocodile' he began to add the signature animal to his attire. Products were launched to the public in 1933, and over the years the brand grew into today's sportswear empire. René had a vision for innovation and design. He invented a tennis ball launching machine, wrote a book about tennis tactics, and created the first steel tennis racket. His fashion brand grew accordingly, branching out from the classic polo shirt to include sunglasses, perfume, streetwear and, in 1993, watches. René passed away in 1996. A perfectionist on the court, and a perfect gentleman at all times, René's personality is reflected in the shapes, colours and aesthetic of everything the brand produces. 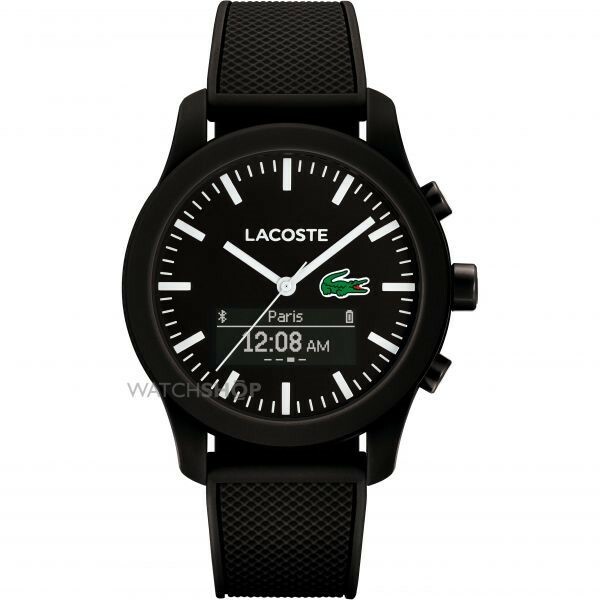 Embracing the modern developments of watch technology, Lacoste has upped its game with the unisex 12.12 Contact Bluetooth Hybrid smart watch. You can link it to your phone for fitness benefits, such as step counting and distance tracking, and receive alerts for calls, texts and social media notifications. With a battery life of 5 to 7 days, it can become your companion for all the important things in your week. The matt finish and bright white detail suits the contemporary flair, and the classic green crocodile pays homage to the brand's roots. 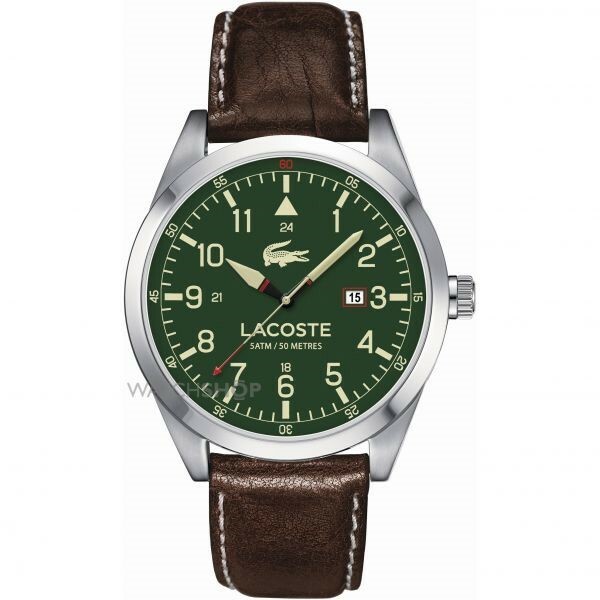 The men's extra slim Moon watch showcases everything the Lacoste brand represents: sophistication, subtlety and style. In one of the range's classic colour combinations, a dark brown leather strap is paired with a touch of midnight blue in the watch face. Stainless steel metallic accents around the face add a touch of luxury, making the elegant hands and ever-present logo stand out. Perfect for both the office and the city streets, it's a vintage-inspired watch that is just as relevant for today's everyman. At the glamorous end of the scale, the Lacoste ladies' Victoria watch has irresistible sparkle without being vulgar. 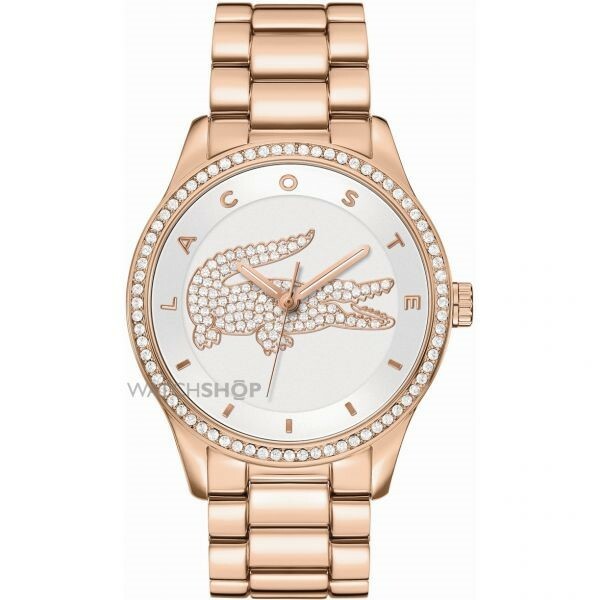 The classy rose gold strap is bright and eye-catching, enhanced by the pearly white face. The crocodile has made an extra effort, dressing up in glitzy gems to create a real wow-factor. This watch pairs easily with a cocktail dress or lavish eveningwear, to bring a unique twist to an evening outfit. The Lacoste 12.12 is like the brand's signature polo shirt, translated to fit on your wrist with a special textured silicone strap that mimics the feel of Lacoste's famous polos. Simple, unique and altogether classy, it's available in a variety of colours ranging from hot pink to the brand's own shade of green. The matt finish and sharp detailing allow it to act as a statement piece without being too loud - ideal for when you're sweating it out on the court, or shouting out courtside. We reckon that if René was going to pick a favourite, this is what he'd have on his arm. Look out for the crocodile, smiling on the watch face. 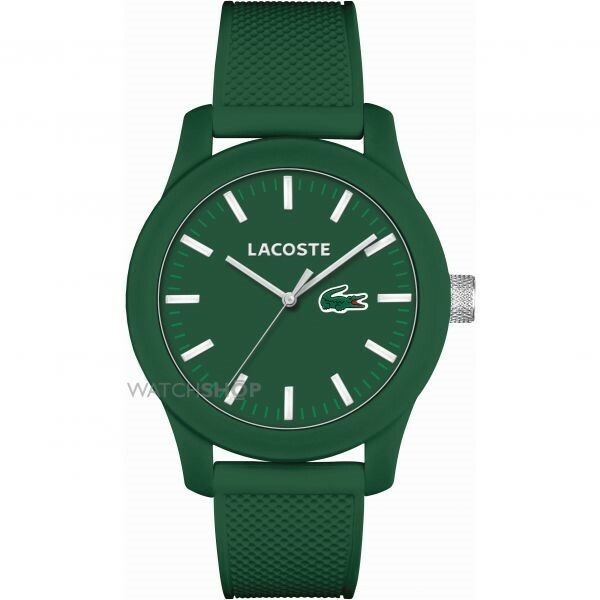 From bright and flashy designs to subtle, sporty pieces, Lacoste has classy timepieces to suit all styles and personalities. Browse the full range and get ready to smash it, court or no court.